Takeshi Kuriyama joined the Alan Wong’s Honolulu ohana with a resume full of experience from some of the best restaurants in the world. On the surface, many would think that his culinary journey has been filled with travel to exotic destinations and memories working with famous chefs. What few know are the professional hardships Takeshi had to overcome to get to this point in his career. During his first month, Takeshi’s job duties consisted only of picking up trash from the kitchen floor. Takeshi remembers one day when he was in the storage room cleaning, and the Chef de Cuisine came into the room while he was there. The Chef didn’t like a certain area of the storage room, and as punishment, walked up to Takeshi and punched him in the face. In this restaurant, it was common for cooks to be punched if the Chef did not like something that the cooks did or if the Chef was upset about something. In addition to punching, the Chef would kick people, throw plates at them, and swear at anyone that displeased him. After a month and a few more punches, Takeshi stood up to his Chef. He expressed his passion for working at that restaurant and his desire to learn something, which shocked his Chef. In response, Takeshi was given a new task for his next month. Every day, he was to separate the leaves of arugula into different sizes. Eventually, he was able to assume a few more responsibilities before his stage was complete. Since those early days, Takeshi has worked at Michelin starred restaurants and award-winning operations across the world from Dubai to Los Angeles. The latest stop in his journey has landed him at Alan Wong’s Honolulu as a Sous Chef because his wife expressed an interest in living in Hawaii. 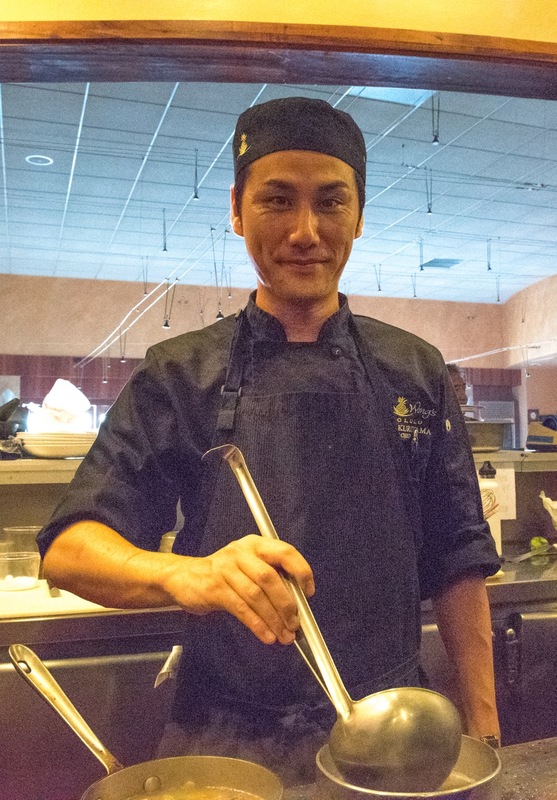 In the few months that he has been in Hawaii, Takeshi has enjoyed his experiences in the Alan Wong’s kitchen.